Julian Onderdonk (1882–1922), Sunlight and Shadow (1910), oil on canvas, 61 × 40.6 cm, Museum of Fine Arts, Houston, TX. Often omitted from lists of William Merritt Chase’s students, and known mainly to Texans, Julian Onderdonk (1882–1922) was a prolific American Impressionist painter. 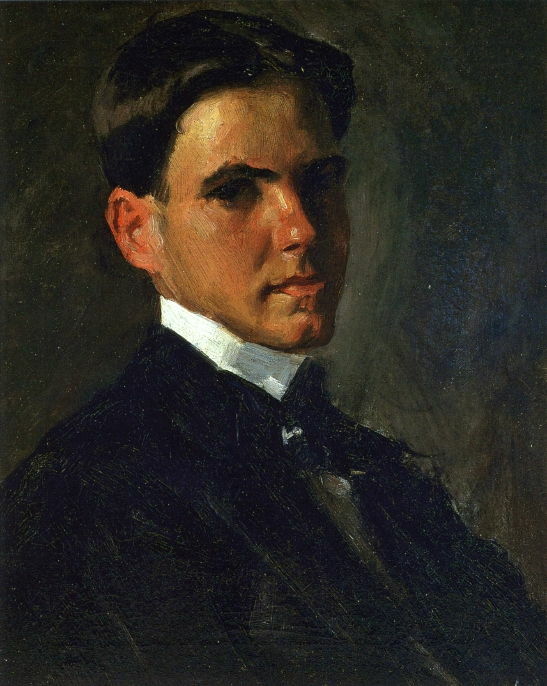 The son of a painter and former student of Chase, he was born in San Antonio, Texas, on 30 June 1882. He was initially taught by his father, and became a competent painter in oils by the time that he was eighteen. Julian Onderdonk (1882–1922), Eleanor Onderdonk (1900), oil on canvas, 55.9 × 45.7 cm, Private collection. He painted this impressive early portrait of his younger sister, Eleanor Onderdonk, in 1900, before he had received any external training. 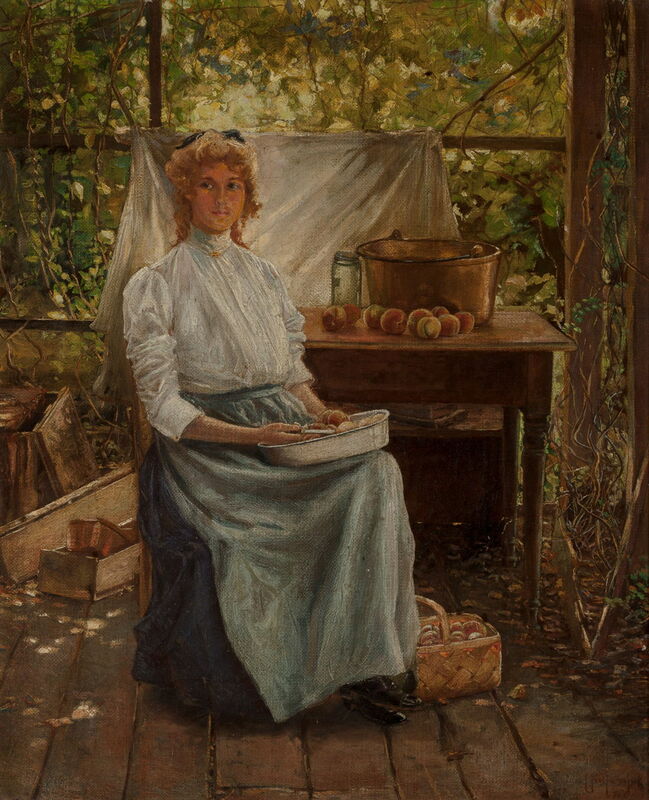 She is seen coring fruit, in preparation for their preservation by bottling, or possibly making into jam or a similar conserve, on the verandah of the family home. In 1901, he withdrew all his savings and borrowed as much as he could from a family friend, and left for New York. He there enrolled at the Art Students League, where he benefited from the structured classes of Kenyon Cox, and Frank Vincent DuMond. 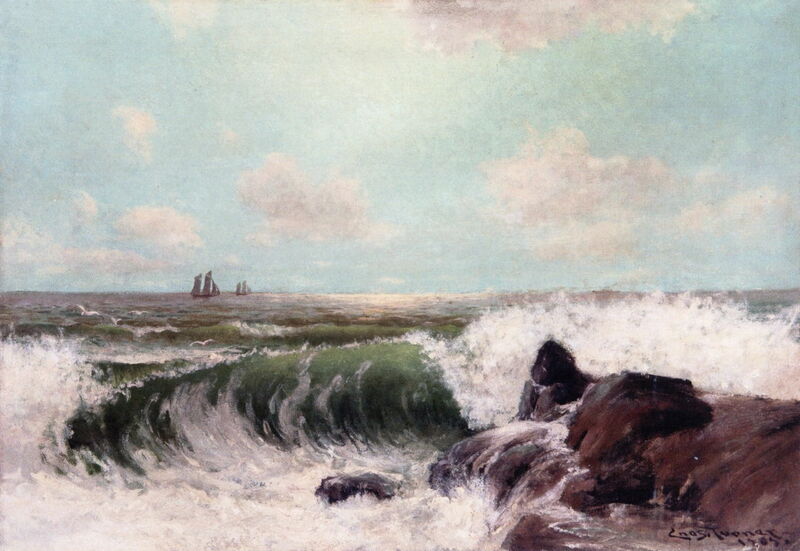 Onderdonk noticed some paintings by Chase at the National Academy of Design, and enrolled for the Shinnecock Summer School of 1901, taught by Chase himself – a move encouraged by his father. Chase painted Onderdonk’s portrait to celebrate the young man’s birthday. Onderdonk continued to receive instruction from Chase, who became his mentor, and some from Robert Henri. In the summer of 1902, Onderdonk married Gertrude Shipman, and the following year their first child was born. His first painting was accepted for exhibition by the Society of American Artists, and in 1904 he sold another to the Dallas Art Association. He tried opening his own Onderdonk School of Art, but he was not yet well known, and it closed. Recent research by James and Kimel Baker suggests that at this time he was in debt, struggling to make ends meet, and to repay a $500 loan. In addition to painting under his own name, he is believed to have provided a Manhattan dealer with a supply of rapidly-painted works signed mostly by ‘Chas. Turner’, with a few by other names too. This is complicated by the fact that there was also a Charles Henry Francis Turner (1848-1908) active in Boston at the time, although his paintings appear quite distinct from those now attributed to Onderdonk. Julian Onderdonk (1882–1922), Stone Bridge in Winter, Central Park (1901-09), oil on canvas mounted on masonite, 27.3 × 34.9 cm, Private collection. 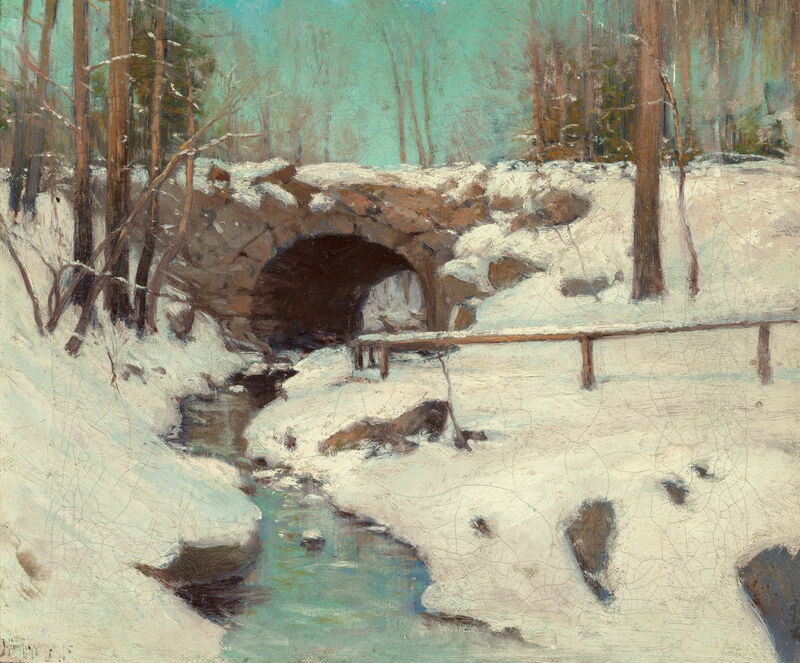 Onderdonk’s Stone Bridge in Winter, Central Park (1901-09) is signed in his own name, and presumed to have been made in the time that he was resident in New York. Julian Onderdonk (1882–1922) (attr) signing as ‘Chas. Turner’, Seascape III (1905), oil on canvas, 35.6 x 50.8 cm, Private collection. The Athenaeum. Signed by ‘Chas. Turner’, Seascape III (1905) is quite different from those works which bear Onderdonk’s own signature, so is now attributed to him. Julian Onderdonk (1882–1922) (attr) signing as ‘Chas. Turner’, Harbour Scene (1906), oil on canvas, 40.6 x 61 cm, Private collection. The Athenaeum. 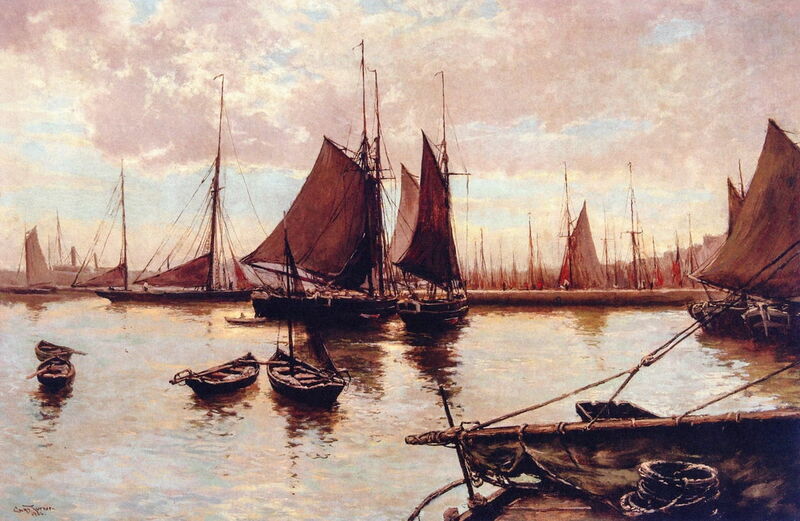 Harbour Scene (1906) is also signed ‘Chas. Turner’ and attributed to Onderdonk. Julian Onderdonk (1882–1922), Shinnecock (1906), oil on canvas, 63.5 x 76.2 cm, Private collection. The Athenaeum. 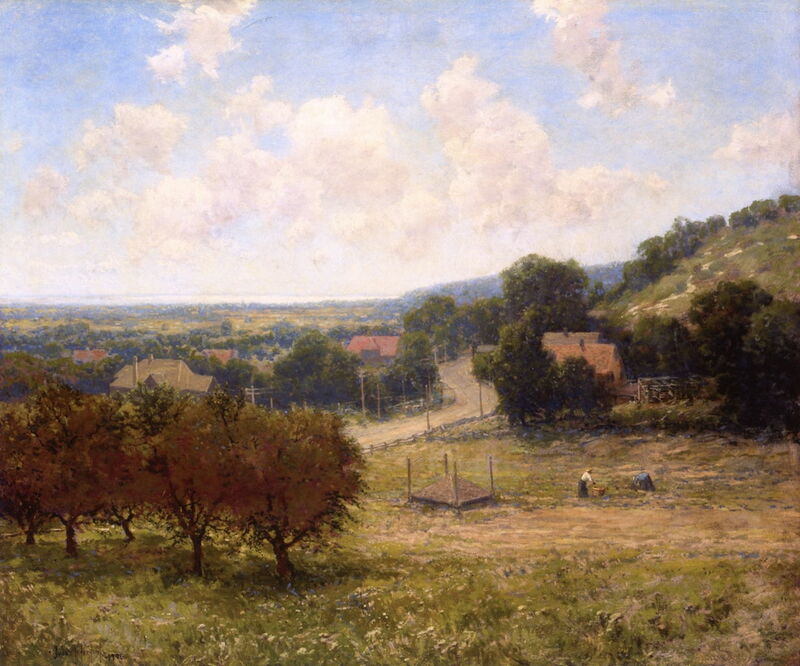 Shinnecock (1906) shows unmistakeable influence of Chase, and was perhaps painted when Onderdonk was a guest of the Chase family at Shinnecock, on Long Island. 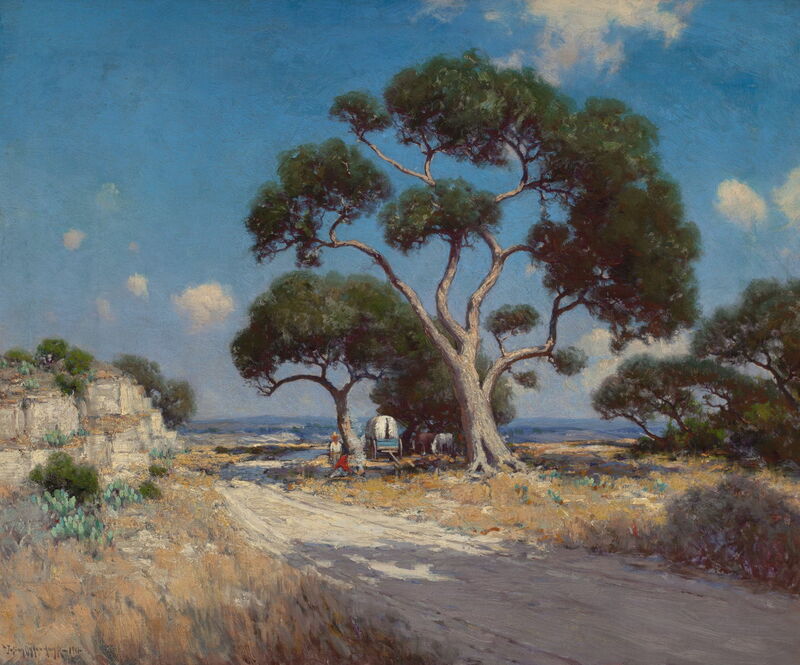 Onderdonk spent increasing amounts of time back in San Antonio, where he was responsible for selecting paintings for the annual Texas State Fair in Dallas. In 1908, his major creditor died, and his debt of $500 was written off, enabling him to stop painting under assumed names for his Manhattan dealer. Onderdonk exhibited his plein air paintings at the Rice Gallery in New York, then the family packed their bags and moved to his parents’ house and the family studio in San Antonio. Julian Onderdonk (1882–1922), Winter Twilight Southwest Texas (1908), oil on panel, 15.2 × 22.9 cm, Private collection. Onderdonk was at last able to devote some time to painting his favourite landscapes, such as Winter Twilight Southwest Texas (1908), using the techniques which he had refined in New York. This is an atmospheric sketch which was probably painted en plein air. Julian Onderdonk (1882–1922), Landscape (c 1908/09), watercolor on paper, 16.5 × 24.1 cm, Private collection. 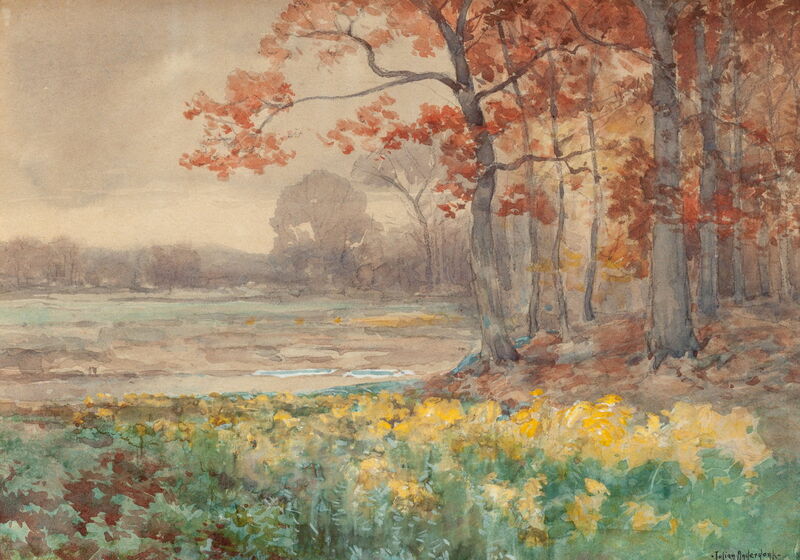 He also painted several fine watercolour studies, including this Landscape (c 1908/09). Julian Onderdonk (1882–1922), Goat Herder at the San Antonio Quarry (1909), oil on panel, 22.9 × 17.8 cm, Private collection. 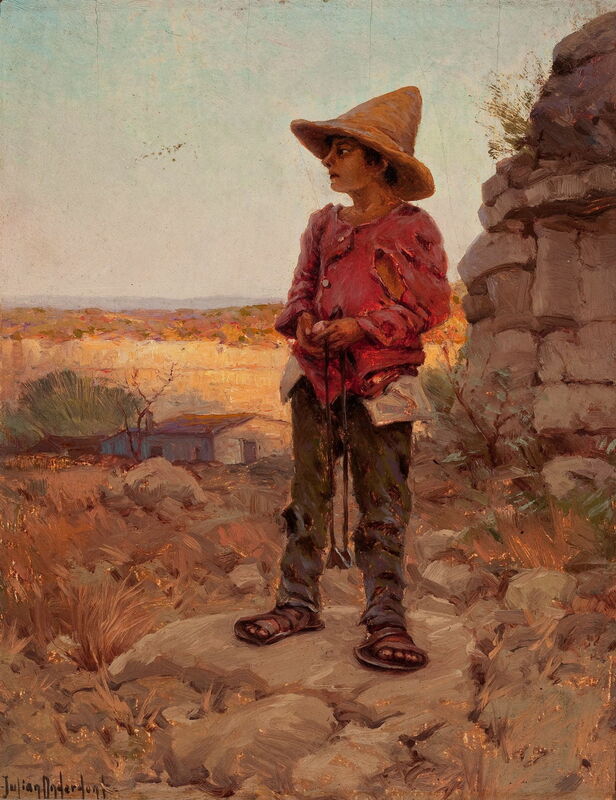 He seldom painted figures, but when he did, he captured great character, as in his Goat Herder at the San Antonio Quarry (1909). The herder of the title appears almost elfin, with disproportionately large feet. Already his studio landscapes were mature, very painterly, and breathtaking in their beauty: Sunlight and Shadow (1910) is a good example, and one of his finest works. 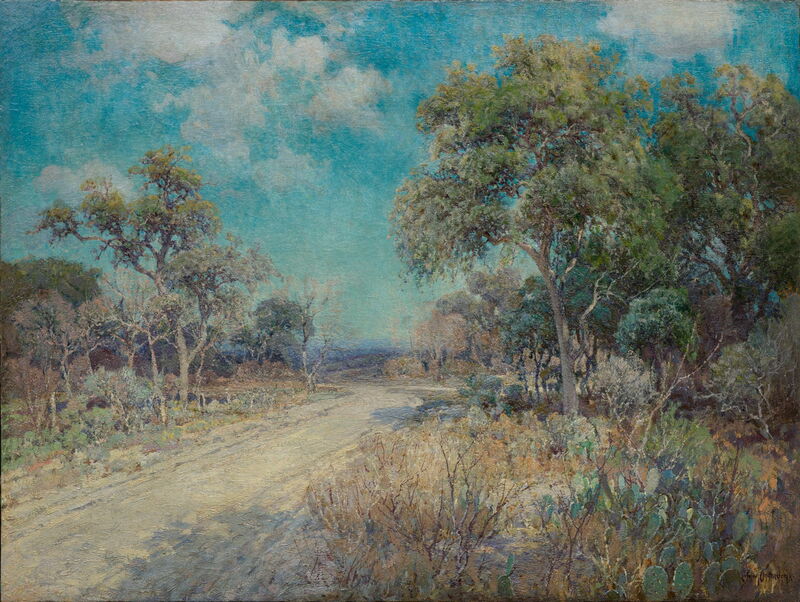 Julian Onderdonk (1882–1922), On the Old Blanco Road, Southwest Texas (1911), oil on canvas, 76.2 × 63.5 cm, Private collection. On the Old Blanco Road, Southwest Texas (1911) shows what was then a deeply rural track, and has now been swallowed into the northern part of the city of San Antonio. Julian Onderdonk (1882–1922), Field of Bluebonnets at Sunset (date not known), oil on canvas, 76.2 × 101.6 cm, Private collection. 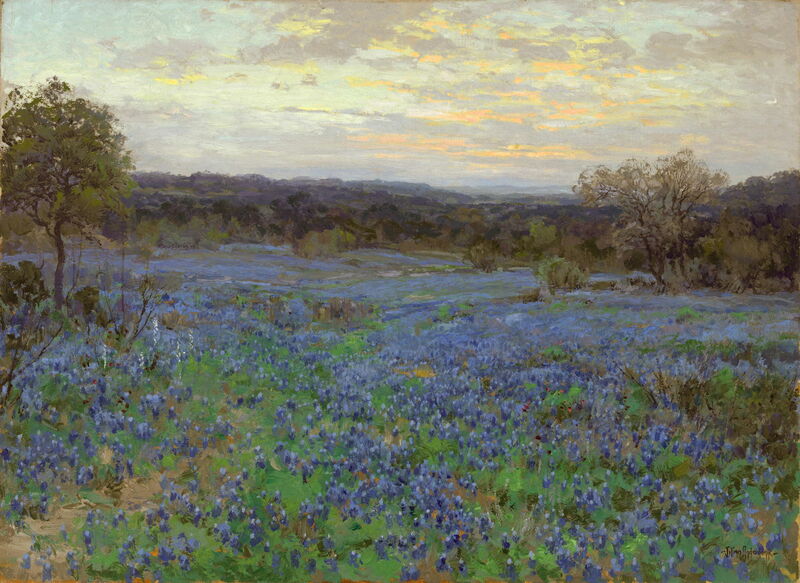 In about 1911, Onderdonk started to paint views featuring the distinctive state flower of Texas: the bluebonnet (a lupin or lupine species). Field of Bluebonnets at Sunset is an undated example. A Hillside of Blue Bonnets – Early Morning, Near San Antonio Texas (1916) is another example. There had been limited opportunities for him to exhibit his paintings in Texas, and initially he relied on the Texas State Fair which he continued to curate. From 1914, he was able to exhibit locally in a San Antonio gallery, and in 1916 sent paintings north to Chicago, where they appeared in the huge Marshall Fields store. He had his first two solo exhibitions that year, hosted by the Palette and Brush Society of San Antonio, and later in Dallas. 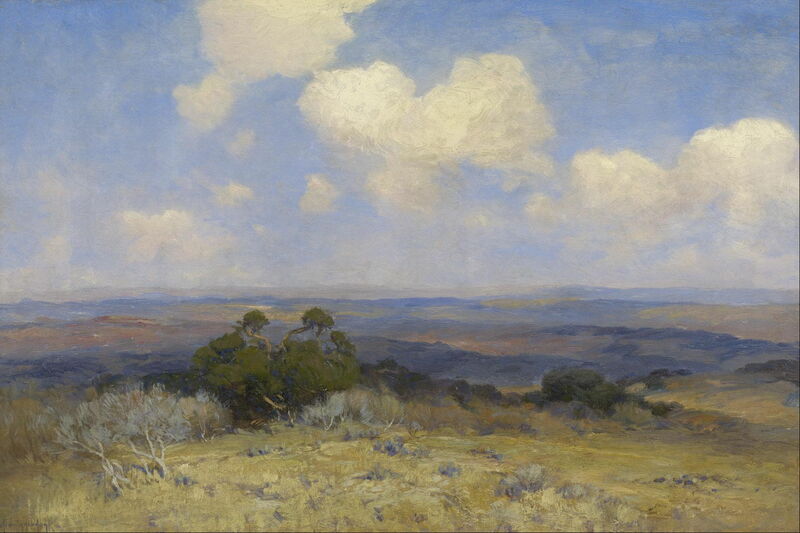 His father died in 1917, leaving Julian Onderdonk as the senior painter in the state. Although he had benefitted from the popular recognition accorded to his bluebonnet paintings, he was naturally keen that his public saw him as much more than just that. Road to the Hills (c 1918) shows how well he could depict the shimmering light, heat, and textures of the countryside, an environment which most painters avoided because of its harshness. 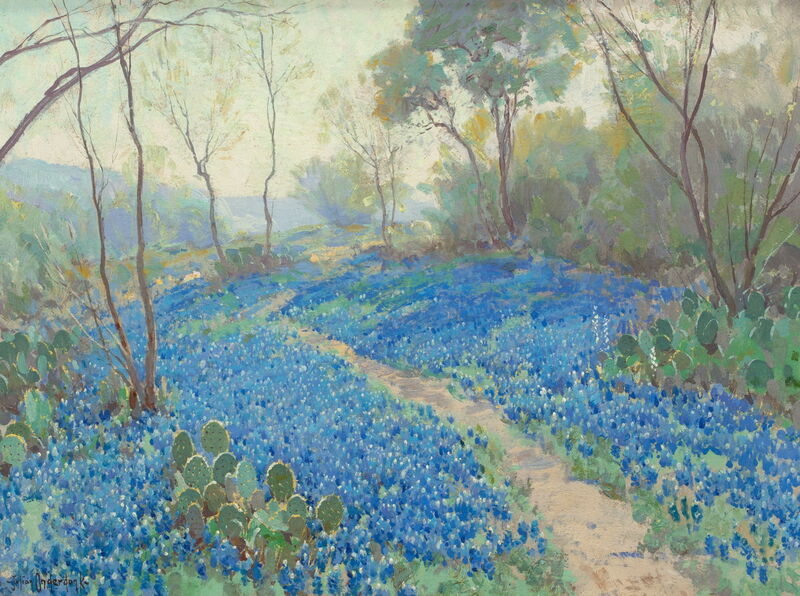 Julian Onderdonk (1882–1922), Early Spring — Bluebonnets and Mesquite (1919), oil on panel, 30.5 × 22.2 cm, Museum of Fine Arts, Houston, TX. Wikimedia Commons. 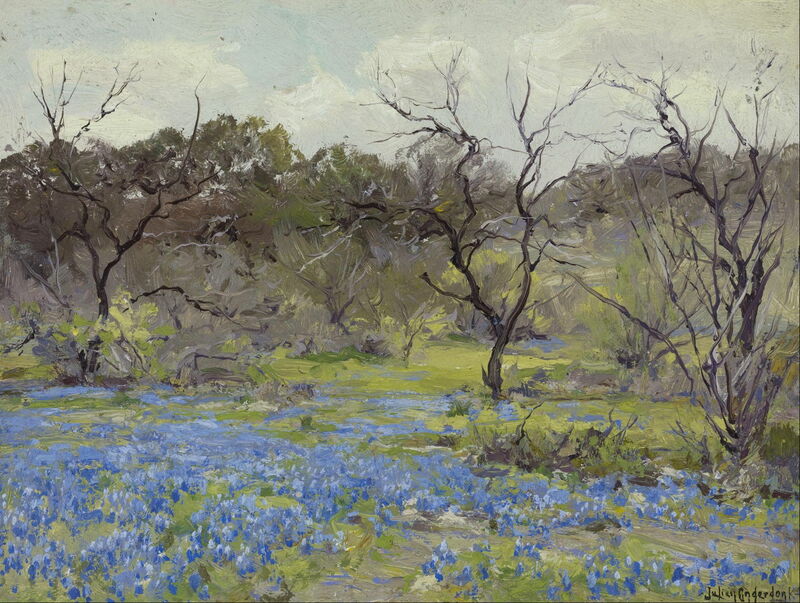 Early Spring — Bluebonnets and Mesquite (1919) is a very painterly sketch made when conditions were less challenging. 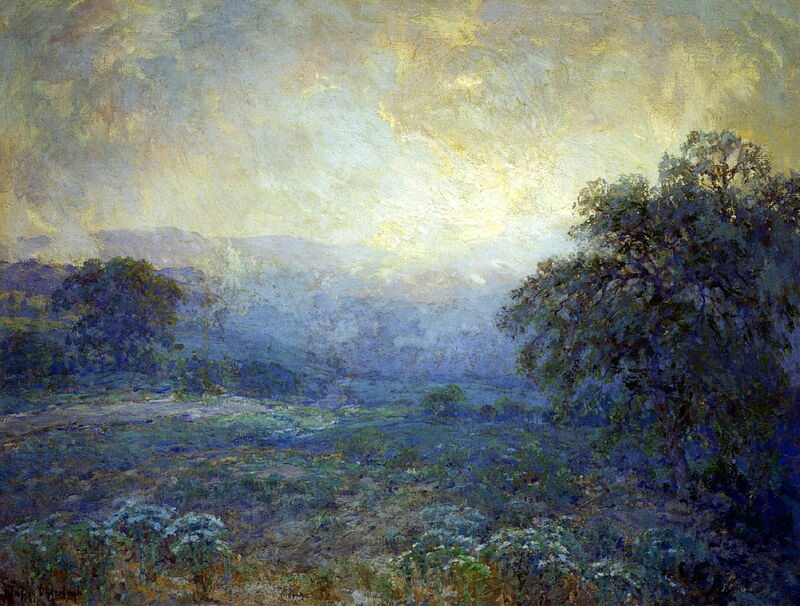 Julian Onderdonk (1882–1922), Dawn In The Hills (1922), oil on canvas, 76.2 × 101.6 cm, Private collection. 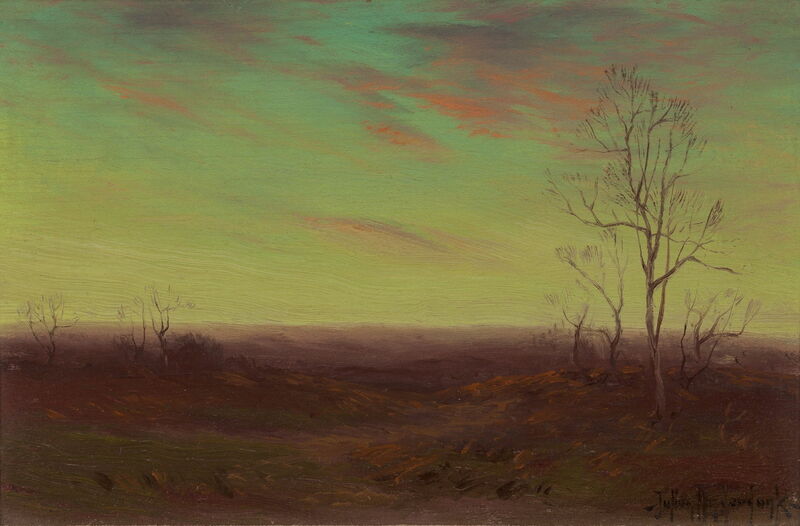 Dawn In The Hills (1922) was probably the last painting which he completed before he suddenly suffered an acute abdominal emergency in 1922, and died after emergency surgery, on 27 October. He was only forty years old, and had just entered his prime. Posted in General, Painting and tagged bluebonnet, Chase, Impressionism, landscape, lupin, lupine, Onderdonk, painting, Texas. Bookmark the permalink.